Ailsa’s travel theme this week is sunset. In 2009 I spent four days in Tahiti with a girlfriend. 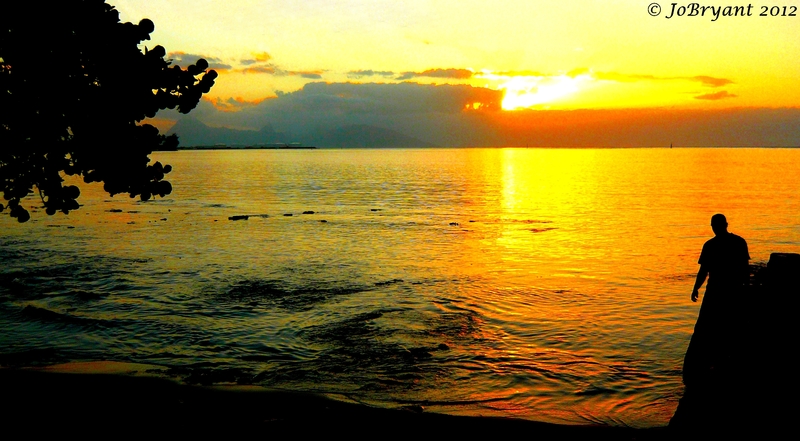 Tahiti is the only place in the world where I have seen a chocolate sunset, the one that I caught above in the header. On our last day we traveled around the island. 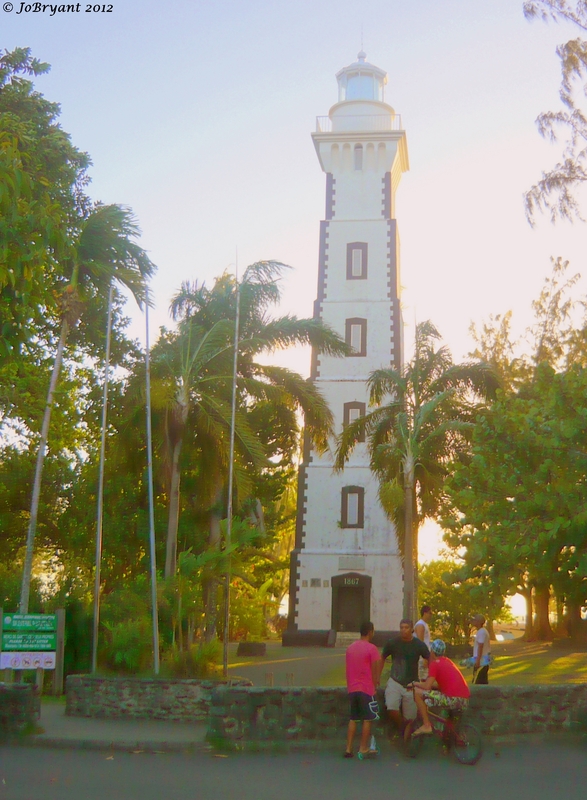 We saw the Point Venus Lighthouse which was built by Robert Louis Stevenson’s father. As I stood there looking at this piece of Tahitian history the sun began her journey to the other side of the world and cloaked the lighthouse in a warm blanket of light. To the grandiose farewell of the setting sun we made out way back in to Papeete. Previous postHappy birthday to me !!!! I really LOVE the lighthouse and the sunset is stunning. ;-). Thanks Gemma…it was stunning to watch. That’s Tahiti for you !!!! We thought so as we sat and watched it happen. How did Tahiti feel to you, Jo? Mom always tells me how much she loved it way back when. What a lovely set of pictures…and oohh, how i love the idea of a chocolate sunset!!! Thank you!! Thanks – it is hard not to take a beautiful shot in Tahiti. Places on my bucket list that remain to be seen. Beautiful. Do go Angeline. But follow the locals to find the great places. Tahiti is sooooooooo much more than the resorts if you take the time to look. You must. But look beyond the touristy things…and you will not be disappointed. Oh Gilly it really is…I loved Tahiti so much more than I ever thought I would. Had lots to do with the person I went with too…she is so easy to travel with…no fuss, no bother…and not in to tourist stuff. It really was Barb…it really was. As if Tahiti was saying goodbye to us in style. I hope they were as lucky as we were…if you leave the touristy things alone and follow the locals…it is magical. These are two lovely images! Thanks…it is a magical place…hard not to take lovely images. It was something to see…I fell a little bit in love with it I think. So unique. Great shots Jo! Love the second one the best. Thanks Jennifer. Me to (2nd shot) but I wanted to show a bit of Tahiti’s history. While I did know that Robert Louis Stevenson was there, I found it fascinating that his Dad was too and built this on the island. I love history/mythology – especially when my feet is touching the soil where it happened. I want to be there now!!!!!!!!!! Wow, these colors of your second picture…! Tahiti was impressive in more ways than one. It was a truly magical place Madhu. I can’t wax lyrical enough about Tahiti…I fell in love while there with every pulse of that beautiful island. If you ever get the chance – go. But check it out before. If I ever go back I would try to rent a house/apartment I think…and stay away from the touristy things. Follow the locals for food…restaurants/supermarkets…and go to the night food market for dinner. Drive down the island to where the real people live. Hire a car or catch the local buses…though remember they don’t run on Sundays. That is where the beauty in Tahiti lies…in the real people and where they live. Thanks for the tips Jo! Thanks Sue…but this was all Tahiti’s magic. It was truly hard not to take a great photo of this…it was soooooooo beautiful to watch. I’d travel there just to see that sunset in the photo above. It was worth it but there is so much more to see that is amazing. That chocolate sunset is just breath-taking, Jo! That should be your header every day…lol. Truly is amazing the range of colors that can be present in a sunrise or sunset. There is no better artist than Mother Nature! You got that right…she is the most wonderful artist in the universe. God how I hope Rodriguez come to tour here one day. I’d forgotten the magnificence of some of the songs. Ooh Tahiti, I’ve always longed to visit, Jo. Wonderful photos, that sunset is insane and that lighthouse is so cool, I love it! Thanks Ailsa. Go there. I loved the place…much, much more than I thought I would. Oh guys…she would love to. but the animals might have something to say about that proposal…and not good eitheer. The Tahitian sunset in your photo is magnificent. I submitted a sunset photo from Noumea which I thought was pretty different, but yours is really something special. Thanks for showing us what it’s like in Tahiti. Thank you Trish. I was lucky to be there to see it. It sure was…when were you in Tahiti ? ?